With equities continuing to claw higher - as 'everything is now fine again', the VIX was in full melt mode, settling -9.6% @ 15.34, the lowest level since late December. 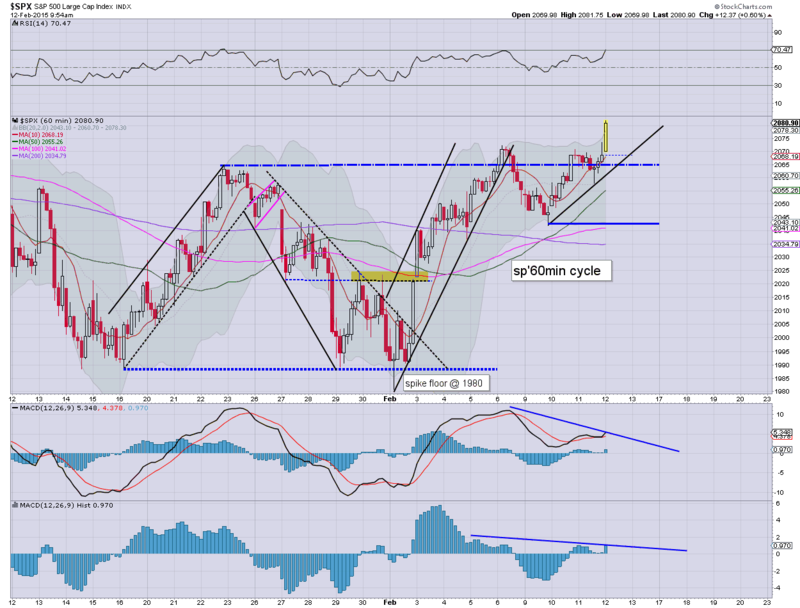 Near term outlook offers the sub teens, if sp' can break into the 2100s. 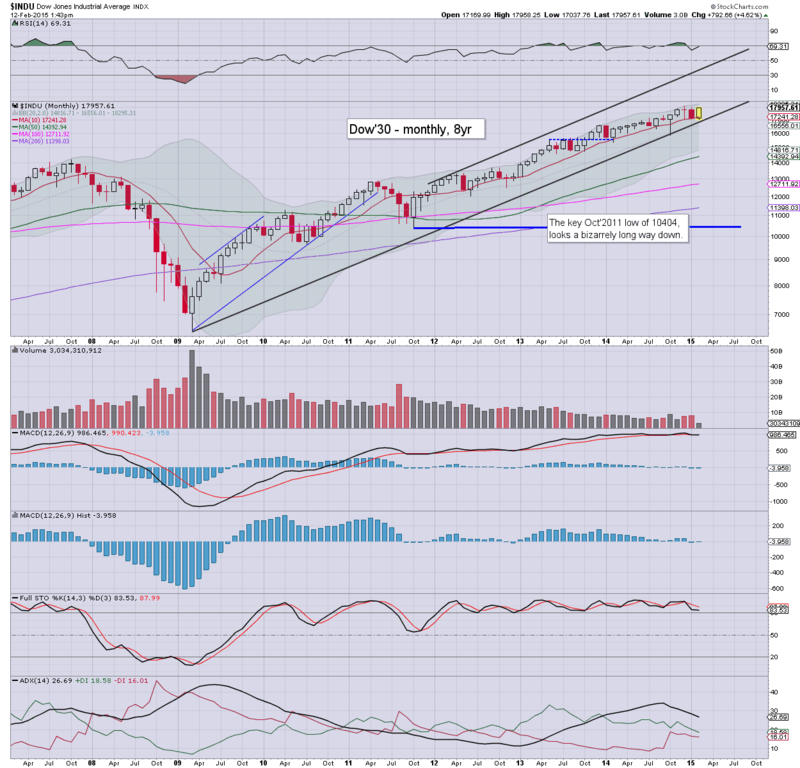 *I think the weekly chart is most important.... we have a clear failure to hold the rather important 16s. If the Greeks want to play tough next Monday, there is a 'moderate' chance of a brief spike into the 18-20 zone, but anything above that now looks highly unlikely for some months. *I remain long VIX.. but seeking to drop on any bounce next Tue/Wed. US equities closed with rather significant gains, sp +19pts @ 2088. The two leaders - Trans/R2K, settled higher by 0.8% and 1.2% respectively. Near term outlook offers new historic highs, which will open the door to the sp'2120/50 zone by early March. Unquestionably, today was a major FAIL for the equity bears... with Mr Market back to very high levels of confidence. After all... Ukraine is now at peace... and the Greeks are going to stabilise and grow their economy. EVERYTHING is fine.... right? Seriously... it would seem the market is right back to the powerful confidence levels seen across 2013/14. Only the Greeks can spoil the party next week, but that now seems highly unlikely. Market is effectively in algo-bot melt mode... grinding relentlessly higher. 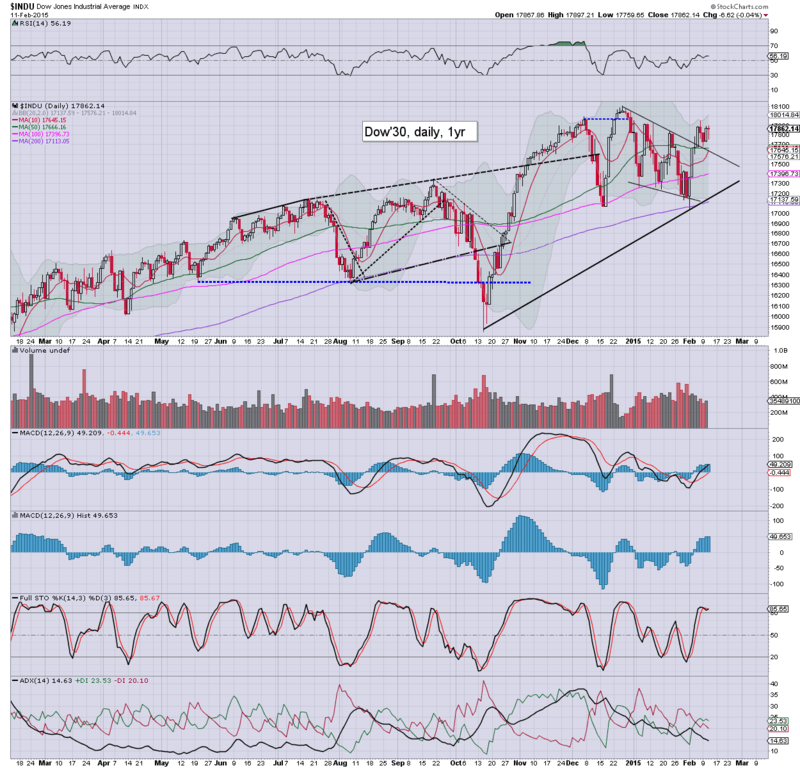 All indexes look set to break new highs in the immediate term. The Greeks increasingly seem likely to kick the can forward for another year or two... allowing the EU.. and most other world equity markets to soar across the year. Without sounding like I'm trying to 'carefully' hedge my words... barring the Greeks coming out with more demands... the 'Greek situation' looks set to be kicked out another year or two. After all.. can kicking is something that the EU does excel at. It would seem that Varoufakis - the Greek finance minister... is nothing more than the same piece of weak minded fool that all his predecessors were. Congrats Greece... you managed to vote in yet another Bankster friend, who is going to sell you out.. and keep you indebted FOREVER. UPDATE 3.24pm.. with sp'2088.... monthly MACD cycle is about to attain a bullish cross.... aka.. MARCON 7... back to outright 100% bullish. For the bears... it is the last line.. and its about to be crossed. A net daily decline now looks completely out of range, and we're almost in classic algo-bot melt mode. VIX is confirming the growing confidence that the 'Greek situation' is of no importance.. and that everything... yes... EVERYTHING... is fine, -7% in the 15.70s. US equities are holding moderate gains, having seen a morning peak of sp'2083. VIX is in melt mode, -6%, in the 15.80s. Metals are holding minor gains, Gold +$6. Oil is holding sig' gains of 2.2% in the $50s. 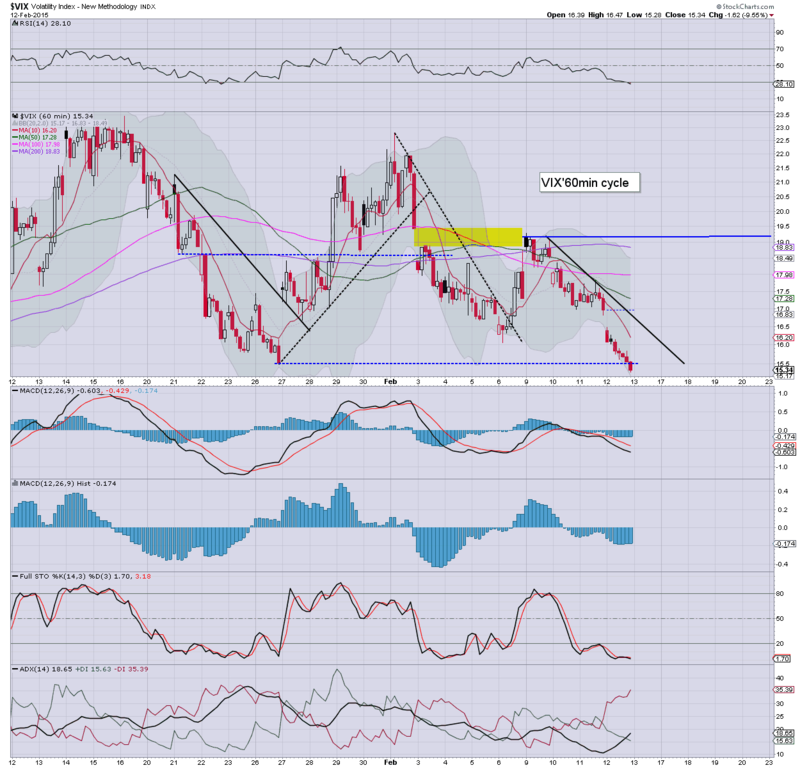 From an equity bear perspective... it is simply not looking good. 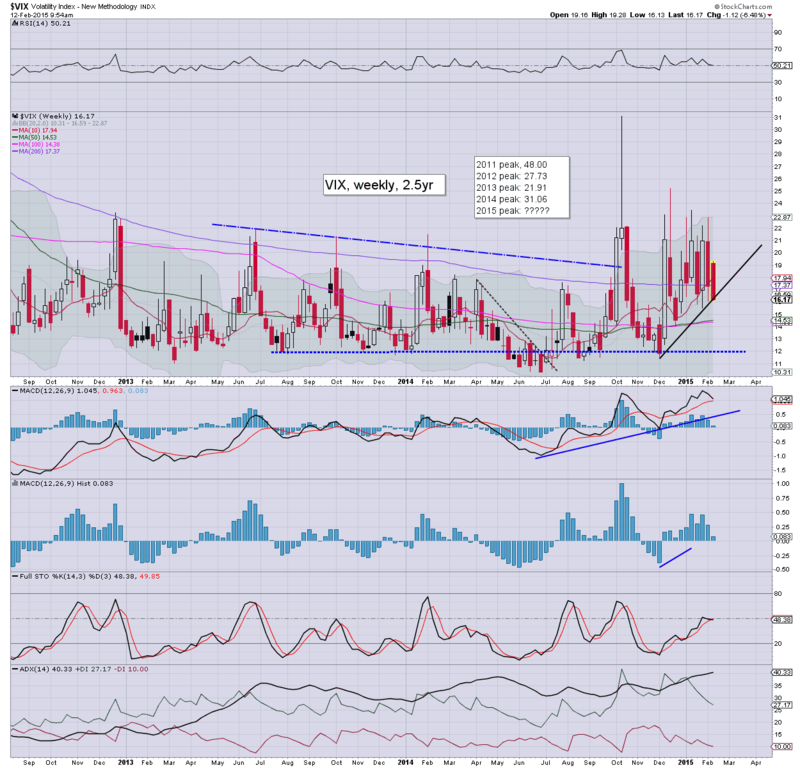 Price action isn't at all bearish, and the VIX is confirming the new equity cycle highs. Even a minor retrace to the 2075/70 zone this afternoon won't be enough to negate the significant breakout - seen briefly yesterday.. but more decisively.. today. Barring a net daily decline - along with VIX 17s... it is white flag waving time for those in equity bear land. With the move to a yearly high of sp'2083, it is unquestionably a rough morning for all those who were seeking weakness into the weekend. 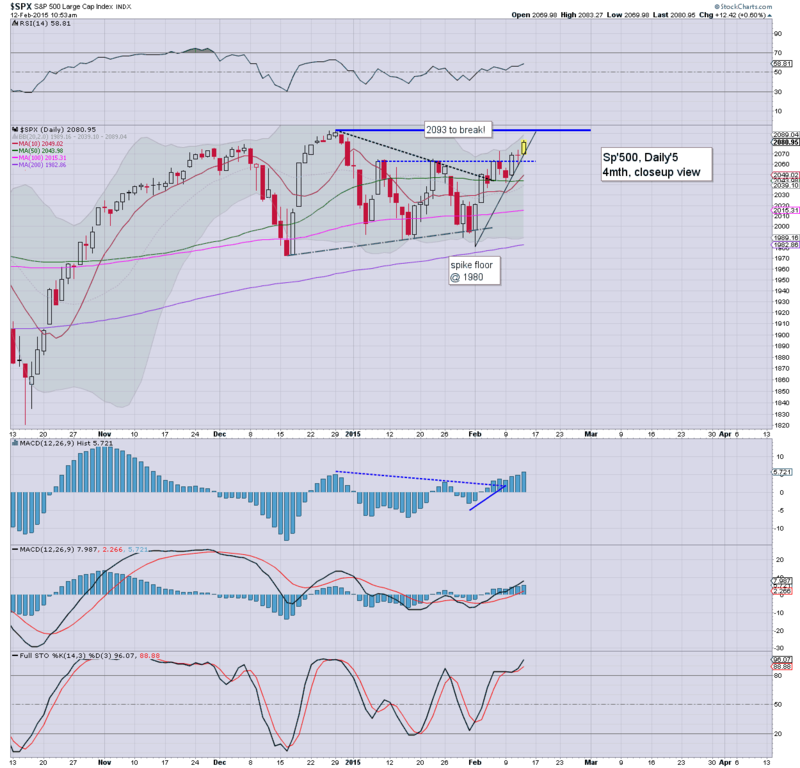 Barring a daily close <2070 (along with VIX 17s), a major breakout is now underway. Metals are holding minor gains, Gold +$2. The hourly candle is offering a very minor signal that we might be close to maxing out... but still... unless we close the day in the 2060s... its white flag waving time for those still seeking downside. Underlying MACD (blue bar histogram) on the daily cycle is a little on the high side, but in theory.. could claw upward for some days.. even weeks. Barring an unlikely news wire headline about Greece... this market is going to battle higher into the long holiday weekend. 11.30am.. Hourly MACD cycle is levelling out... with sp'2078.... but as noted... bears must see a net daily decline to have ANY hope. 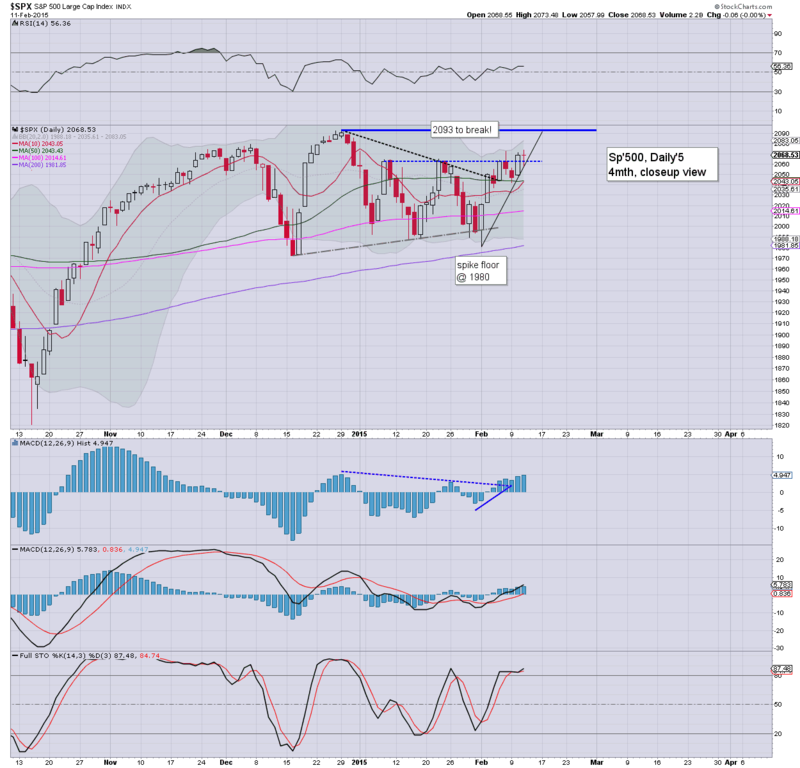 Right now, the old target of the sp'2020s look well out of range. Oil cooling, +1.5%... if Oil can turn red... that'll be something. US equities open decisively higher, with the sp' just 0.7% away from breaking a new historic high. 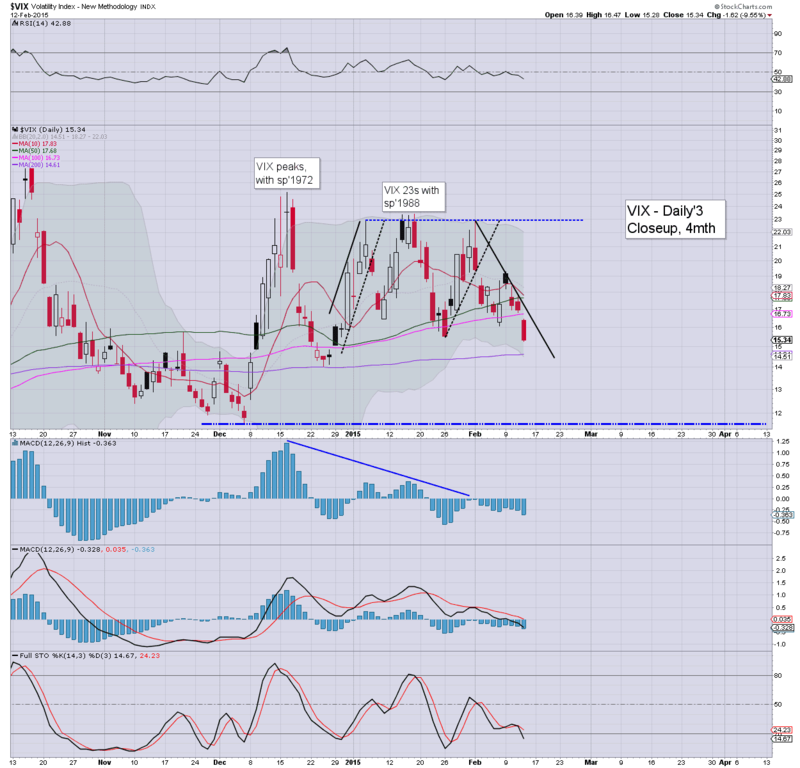 VIX is confirming the move, -4%, set to lose the 16s. Metals are seeing a bounce, Gold +$6. Oil is building strong gains, +2.9%. A major fail for the equity bears to contain the rally. Barring some Greek news (seemingly unlikely today/tomorrow), market looks set for net daily gains, and VIX will likely lose the 16s. Seen on the bigger weekly cycle, VIX 15s would be a key sign. Good morning. Futures are moderately higher, sp +11pts, we're set to open at 2079, a mere 14pts shy of a new historic high. Metals are bouncing, Gold +$4. Oil is similarly in bounce mode, +1.7%, re-taking the $50 threshold. So, for the second consecutive day, we're set to be trading above old resistance of sp'2072. A downside reversal from here would seem rather unlikely.... its another equity bear FAIL. Notable early weakness: TSLA, -7% in the $196s, having a major earnings miss. The net cash outflows are an increasing concern, but it seems the CEO has no particular interest/care for turning consistent profits for another FIVE years. US equities closed moderately mixed, sp -0.1pt @ 2068. The two leaders - Trans/R2K, settled +0.3% and -0.1% respectively. 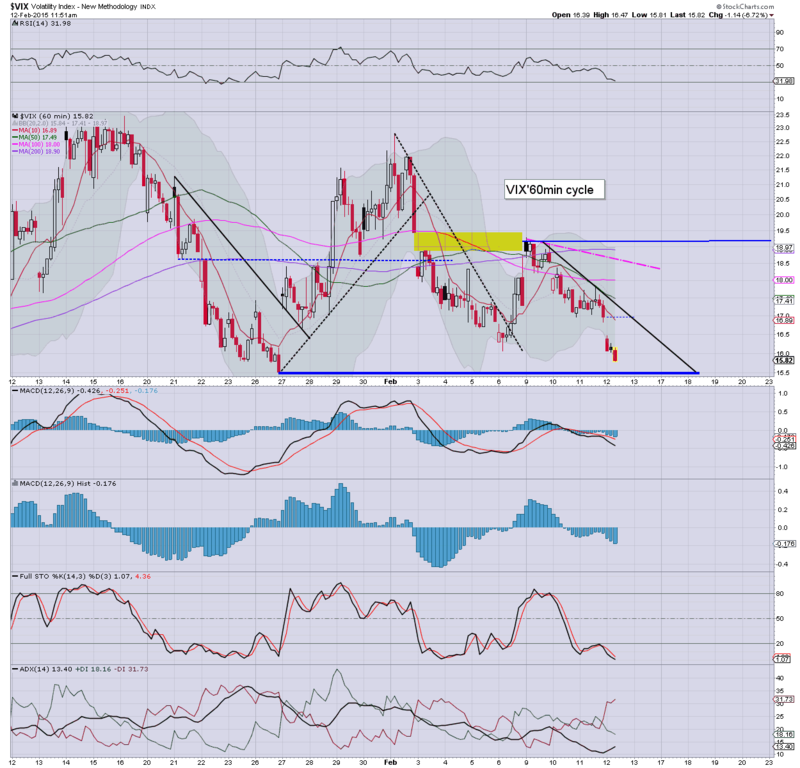 Near term outlook remains uncertain whilst the Greek situation remains unresolved. So, a brief break above key resistance of sp'2072 on a Whitehouse press release. The daily close of 2068 keeps the near term outlook highly uncertain. 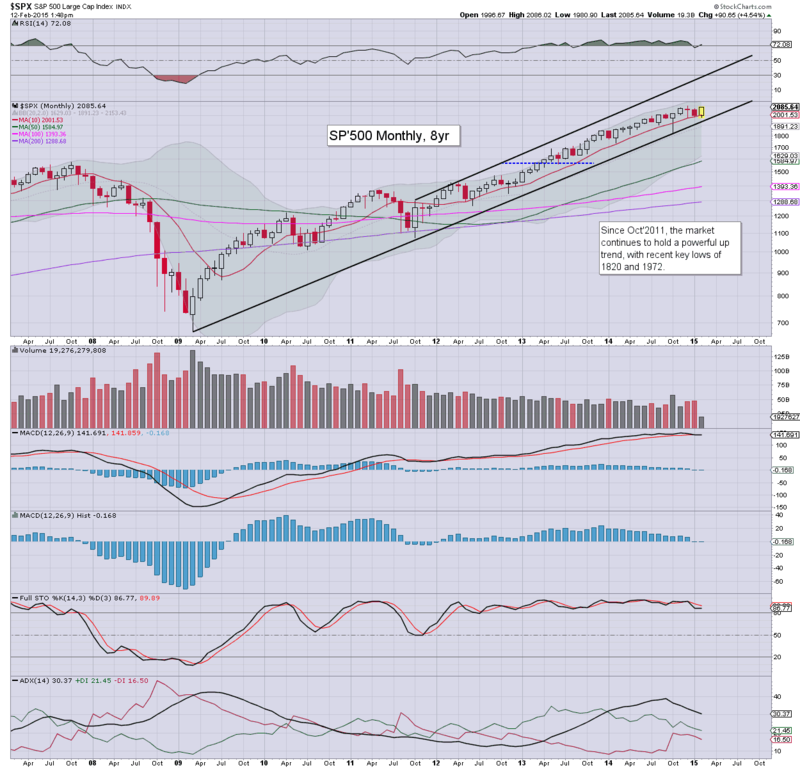 It won't take much for the market to sell down to the sp'2020s, but its not looking so great for those seeking more significant downside into the early spring. Thursday will see the usual weekly jobless claims, retail sales, and bus' invents'. Market will of course remain highly vulnerable to any sporadic Greek news. A CNBC 'source' quoted the Greeks having agreed on something, futures jumped 15pts... to equiv' of sp'2083. That report was refuted shortly after, although market was still holding gains of around 0.5%. Regardless, this remains a pretty frustrating market. Right now, I'll be glad to just drop my VIX block for breakeven by the Friday close. As many might agree... its rarely easy.